Whitaker, a former college football tight end and United States attorney in Iowa, and a onetime Senate candidate in that state, has previously questioned the scope of the investigation. In a column for CNN last year, Whitaker wrote that Mueller would be going too far if he examined the Trump family’s finances. “This would raise serious concerns that the special counsel’s investigation was a mere witch hunt,” Whitaker wrote, echoing the president’s derisive description of the investigation. Mueller has subpoenaed the Trump Organization for documents related to Russia. Until now, the investigation has been overseen by Rod Rosenstein, the deputy attorney general, because Sessions recused himself in March 2017, citing his active role in Trump’s 2016 campaign. Democrats quickly demanded on Wednesday that Whitaker also remove himself from taking charge of the inquiry, citing potential conflicts of interest, including his criticisms of the Mueller investigation, as well as his connections to a witness in that investigation, Sam Clovis, a former Trump campaign aide. In 2014, Whitaker was the chairman of Clovis’s unsuccessful campaign to become Iowa state treasurer. Justice Department ethics advisers may be asked to weigh whether Whitaker should recuse himself. If he were to agree to do that, Rosenstein would continue to oversee the special counsel. John F. Kelly, the White House chief of staff, called Sessions before the president’s postelection news conference Wednesday to tell the attorney general that Trump wanted him to step down, the administration official said. Trump, who did not speak with Sessions himself, ducked questions about Sessions’ fate at the news conference. Sessions then had his letter, which was undated, delivered to the White House. “Dear Mr. President, at your request I am submitting my resignation,” he wrote. He added, “Most importantly in my time as attorney general, we have restored and upheld the rule of law,” and thanked the president. The president has regularly attacked the Justice Department and Sessions, blaming the attorney general for the specter of the special counsel investigation into ties between Trump’s campaign and Russia. Trump has said for months that he wished to replace Sessions, but lawmakers and administration officials believed that firing the attorney general before the midterm elections would have had negative consequences for Republicans in tight races. So it came as little surprise when Sessions’ resigned the day after the midterms were over. “He took the job and then he said, ‘I’m going to recuse myself.’ I said, ‘What kind of a man is this?’ ” Trump said this year in a Fox News interview. Installing Whitaker could clear the way for Trump to force out Mueller. To dismiss a special counsel, the president has to order the attorney general or, in the case of a recusal, the deputy attorney general, to carry it out. Rosenstein has said that he sees no justification to dismiss Mueller. Trump has already fired James Comey, the FBI director originally overseeing the investigation. In addition to Mueller’s subpoena of the Trump Organization, an umbrella company that encompasses Trump’s business ventures, federal prosecutors in Manhattan indicted the president’s former lawyer, Michael Cohen, for campaign finance fraud related to payments made on behalf of Trump. In February 2016, Sessions became the first sitting senator to endorse Trump’s presidential campaign, and in the months leading up to the election, he became one of the candidate’s closest national security advisers. Only weeks after he was confirmed as the United States’ top law enforcement officer, Sessions became ensnared in the Russia inquiries that have consumed Trump’s presidency. He recused himself from overseeing the Justice Department investigation in March 2017, after revelations that he had failed to report encounters with Ambassador Sergey Kislyak of Russia during the 2016 campaign. At the time, Sessions said there was nothing nefarious about those meetings, although he acknowledged that he “should have slowed down” and been more thoughtful in denying any contacts with Russian officials during his Senate confirmation process. His recusal was one of his first public acts as attorney general. In a July 2017 interview with The New York Times, Trump unexpectedly lashed out at Sessions. Trump never forgave Sessions, and over the next year and a half, his complaints about Sessions on Twitter and in his public comments became more pointed and insulting. At various points, he called Sessions “beleaguered,” “VERY weak” and “DISGRACEFUL.” In private, he referred to him derisively as “Mr. Magoo,” after the befuddled cartoon character. Trump also publicly badgered Sessions to open investigations into his defeated rival, Hillary Clinton, and other Democrats, and when Sessions did not, the president excoriated the attorney general. In March, Sessions said he still believed he did the right thing in recusing himself. 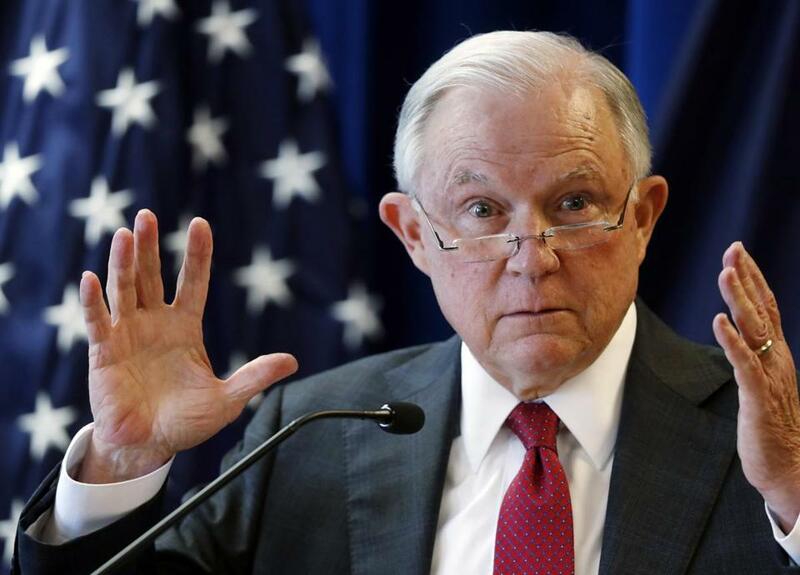 “I don’t think the attorney general can ask everybody else in the department to follow the rules if the attorney general doesn’t follow them,” he told Time magazine. As attorney general, Sessions made a forceful mark on the Justice Department. He rolled back some of former president Barack Obama’s signature policies as he encouraged federal prosecutors to pursue the toughest possible charges and sentences against criminal suspects. He successfully advised Trump to rescind Obama’s program protecting nearly 700,000 young immigrants who were brought to the country illegally as children. He sued California over its sanctuary laws and targeted states that legalized marijuana. Sessions, 71, got his start in politics as a US attorney in Alabama, but his nomination for a federal judgeship was blocked by the Senate amid charges of racial insensitivity. He mounted a comeback by winning election as the state attorney general and then, in 1996, to the Senate that had once rejected him.